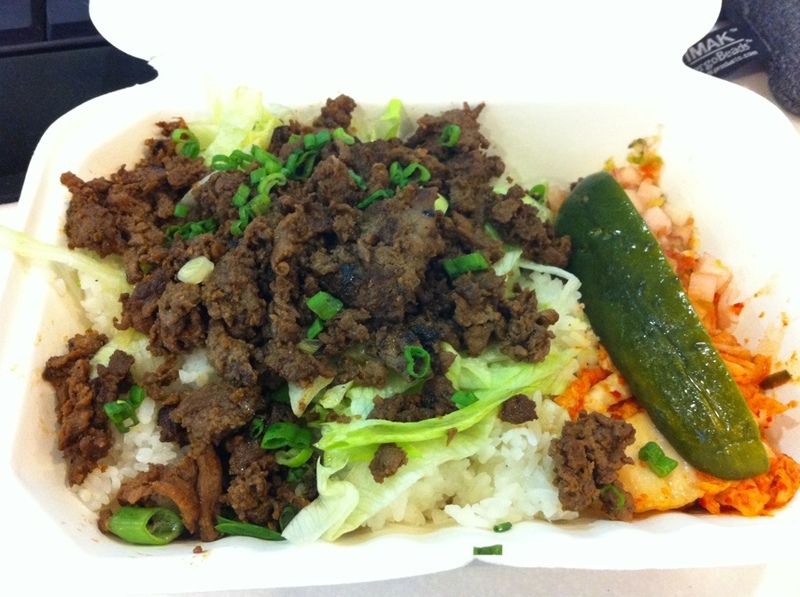 The beef Kimchi bowl from Kimchi taco truck. It looks good, don't it? Having now sampled the Kim-cheesesteak and the Korean Tacos at Kimchi Taco truck, it was time to complete the circuit and try the Kimchi Bowl. I’m glad I did, because it is by far the best thing on their menu, hands down. Stir in some kimchi... .
First of all, if you like Korean BBQ, this will scratch the itch. Granted, it’s not the full blown Bul Go Gi you might be hoping for, but nonetheless all the pickled Kimchi flavor you could want is present. The portion is well ample, and at $8 it seems like a reasonable deal. 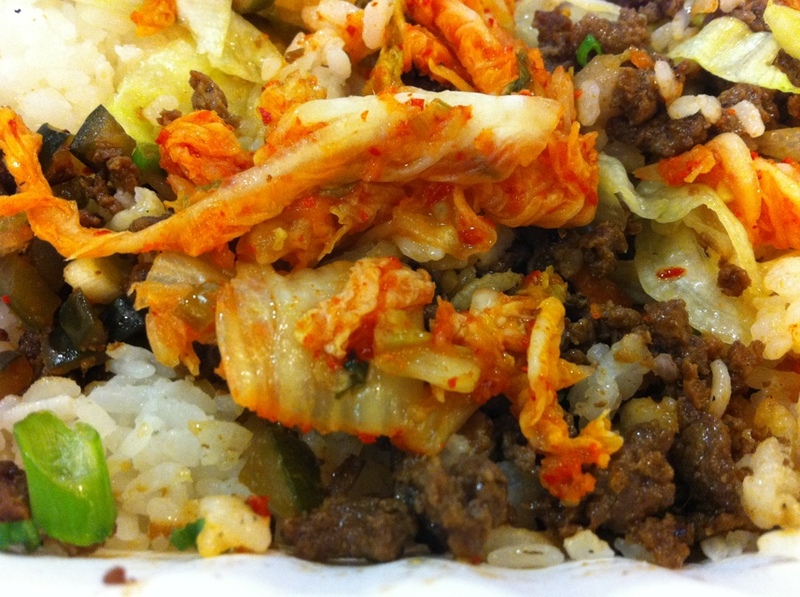 The best thing about the Kimchi bowl is that all the flavors can be appreciated in an isolated fashion or ensemble, whereas with the tacos or Kim-cheesesteak all the flavors are thrust together out of necessity. With the bowl, you can enjoy the flavorful beef or pork or cabbage or whatever at your leisure. Those maniacs... what are they up to? The lunatic chefs have gone berserk with their Kimchi-ing. 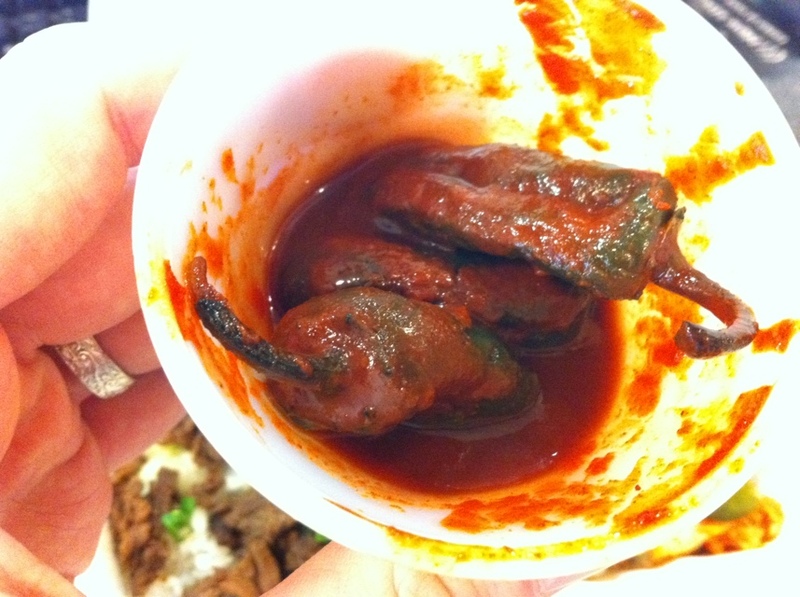 Take a look at the pickled jalapeno they gave me. I will give you one guess as to how spicy it was. When I eventually regained feeling in my tongue I had to make sure that there wasn’t a hole burned straight through it. I’m kidding a little, but it was some real mad scientist stuff. I couldn’t handle the heat, though. For all you heat freaks out there, though, you’ll love it. 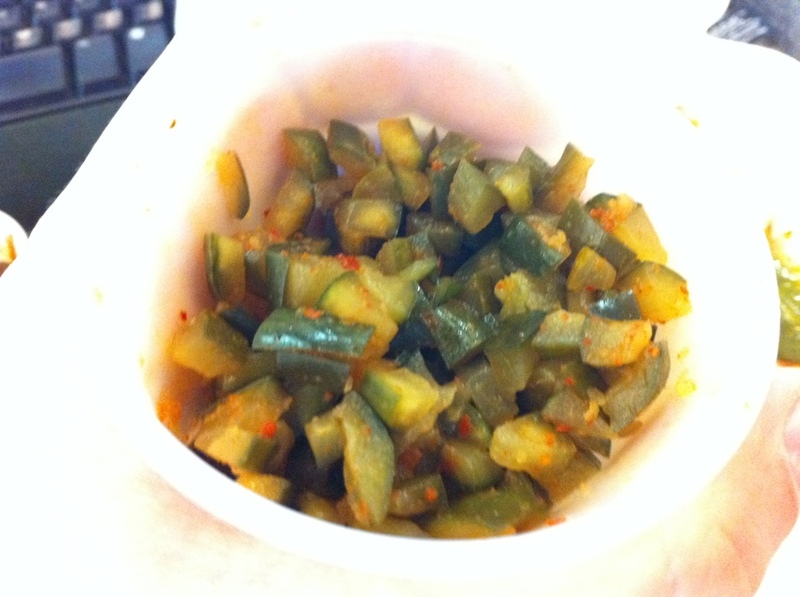 I really enjoyed the extra bits of chopped pickle. Spreading them across the beef was delightful and delicious. Sweet and fermented pickle flavors at the same time. 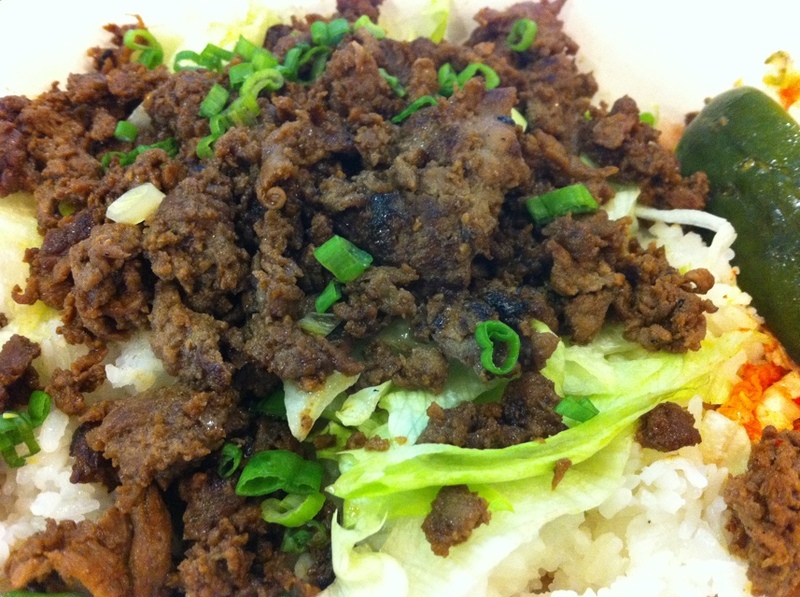 Beneath the bed of beef, rice. The rice sitting below the beef is excellent. It has that faintly sticky quality, making it truly hearty. It also absorbs all the various flavor elements, either from cabbage or pickled onions or what have you. 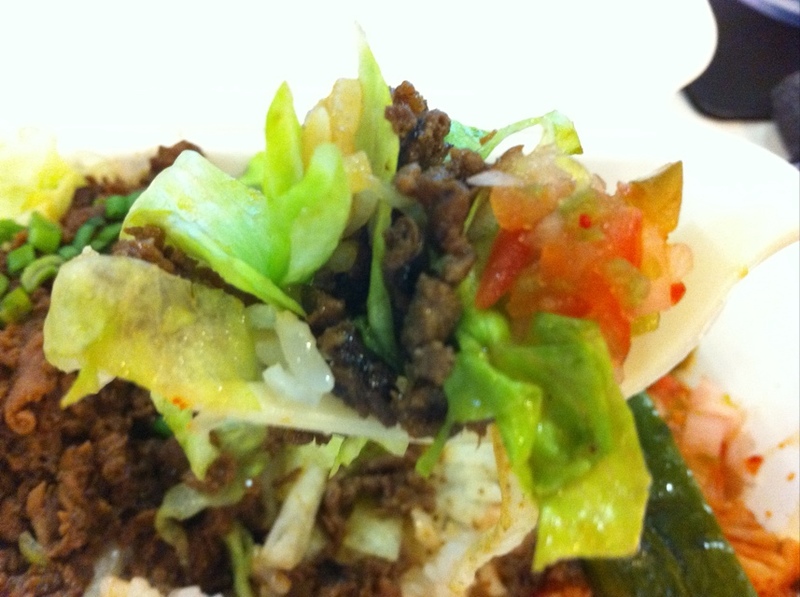 By the way – I prefer the beef they served with the Kimchi bowl over the beef they serve with their tacos. Again, the best part of the bowl is choosing what you’re interested in tasting by the forkful. Since I find the variety of flavors at work in Korean food so interesting and compelling, it makes for a very pleasant lunch. All in all, I’ll stick with this, unless I occasionally have a hankering for the tacos.